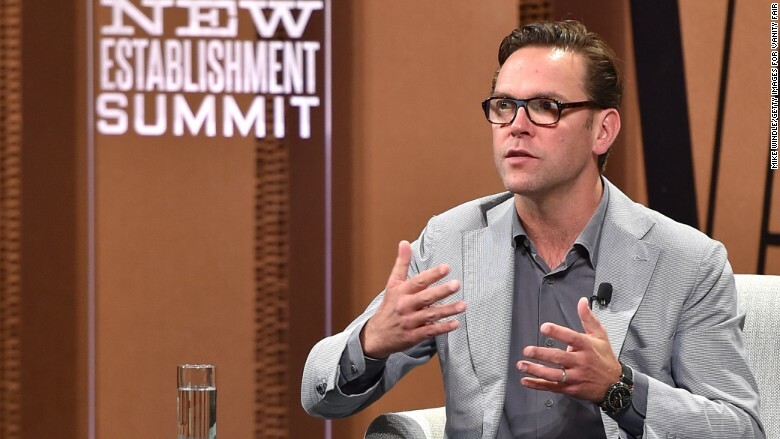 James Murdoch, the 21st Century Fox CEO and son of Rupert Murdoch, one of President Trump's close informal advisers, has written a scathing email denouncing the president's reaction to the violence in Charlottesville. The younger Murdoch also pledged $1 million to the Anti-Defamation League, the international non-governmental organization that works to fight anti-Semitism. "[W]hat we watched this last week in Charlottesville and the reaction to it by the President of the United States concern all of us as Americans and free people," Murdoch writes in the letter, a copy of which was obtained by CNNMoney. "These events remind us all why vigilance against hate and bigotry is an eternal obligation — a necessary discipline for the preservation of our way of life and our ideals," Murdoch continues. "The presence of hate in our society was appallingly laid bare as we watched swastikas brandished on the streets of Charlottesville and acts of brutal terrorism and violence perpetrated by a racist mob." He also writes, "I can't even believe I have to write this: standing up to Nazis is essential; there are no good Nazis. Or Klansmen, or terrorists. Democrats, Republicans, and others must all agree on this, and it compromises nothing for them to do so." Murdoch's letter comes after several CEOs and business leaders pulled out of Trump's business panels in response to his remarks drawing a moral equivalence between white supremacists and left-wing protesters. It is all the more notable, however, because of Murdoch's father's relationship with the president. Rupert Murdoch, the executive chairman of 21st Century Fox, speaks with the president several times a week, sources at both the White House and 21st Century Fox have told CNNMoney. 21st Century Fox is also the parent company of Fox News, which has been aggressively pro-Trump on its most-watched shows. The younger Murdoch begins his letter by saying he was writing "in a personal capacity, as a concerned citizen and a father," but he went on to highlight how his business had tried to contribute to a diverse and tolerant society. "Diverse storytellers, and stories, can make a difference, and that diversity, around the world, is a crucial strength and an animating force in my business," he writes. "Often times not everyone agrees with the stories and positions that emerge from this, and that can be difficult. Certainly no company can be perfect. But I'm proud of the powerful art that can emerge, and I'm grateful to all of my colleagues who make this happen. From the potent and compelling narrative of '12 Years a Slave', to the streets of Pakistan and the bravery of an extraordinary young woman that we saw in 'He Named Me Malala', to name just a few, we've never been afraid to help storytellers and artists say important things -- hard things, too." Murdoch concludes the letter saying that he and his wife Kathryn would donate $1 million to the ADL, and encouraging his friends to donate as well. "We hardly ever talk about our charitable giving, but in this case I wanted to tell you and encourage you to be generous too." On Wednesday, Kathryn Murdoch tweeted a tweeted a link to an article in Politico by former George W. Bush speechwriter Matt Latimer calling on Republicans to stand up against Trump over his "both-sidesism on neo-Nazis."